Some of you asked right away when I mentioned I was starting a blog. "Will you do empanadas?" Well, of course! Many many moons ago I was an exchange student in Argentina. 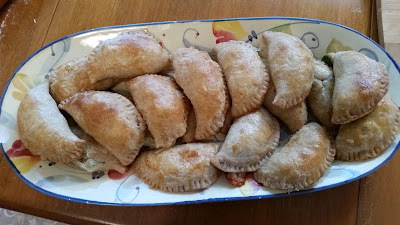 When I first got back, my host sisters (who were in the States) and I tried to make empanadas with some kind of dough from a can. We failed miserably because it was completely the wrong texture. From then on, I was on the hunt for a recipe that would work consistently. 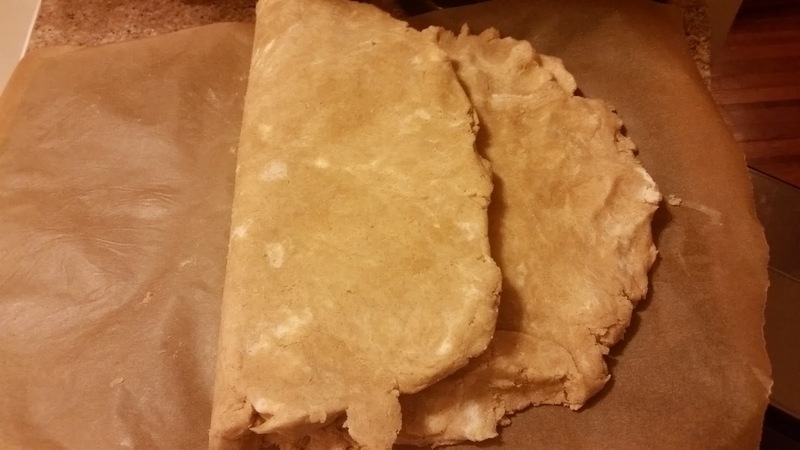 Standard pie dough made from flour, butter and water tastes good, but isn't quite pliable enough. Fillings posts to follow soon! Cafe Azul's Masa Para Empanadas. I failed to write down which magazine it was from or where Cafe Azul is, but I still have the now very tattered piece of paper I wrote the recipe on. 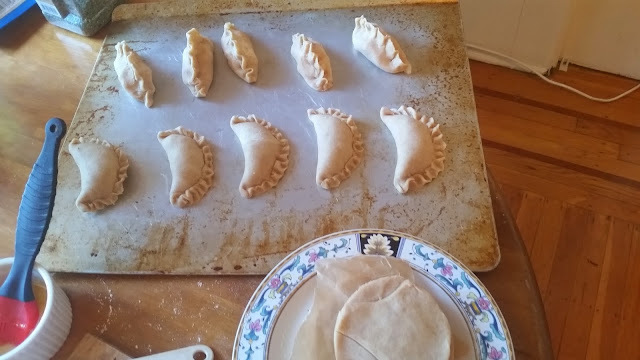 Since then it has become easier to find the pre-made, frozen dough that most Argentines use, tapas para empanadas, in the US. It's often found in Italian delis like Lucca in San Francisco. 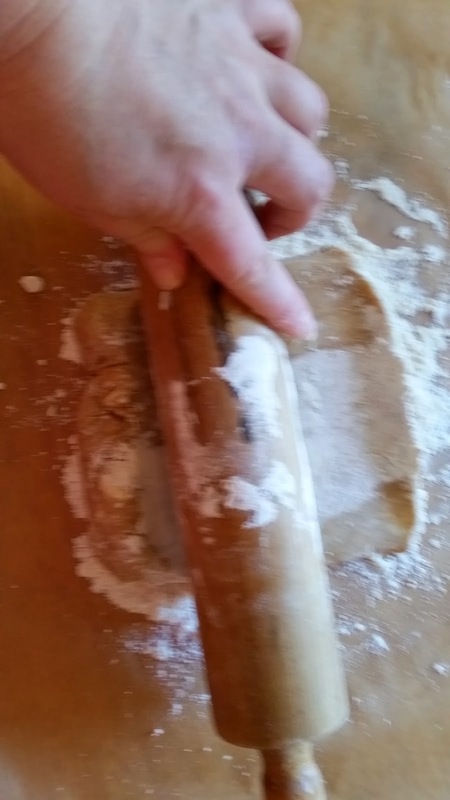 But when you have a recipe this good and you've got the hang of the rolling pin, why not make the real deal? It makes 24 big empanadas, but I usually make them smaller for parties, so I get around 40. 1 lb cold butter (I know, I know. It's party food). 1 Tbsp white vinegar (champagne, white wine or rice vinegar, or maybe distilled in a pinch). 1. Mix flour and salt in the bowl of a 10-cup food processor or a stand mixer (or a large bowl if you plan on mixing by hand). 2. 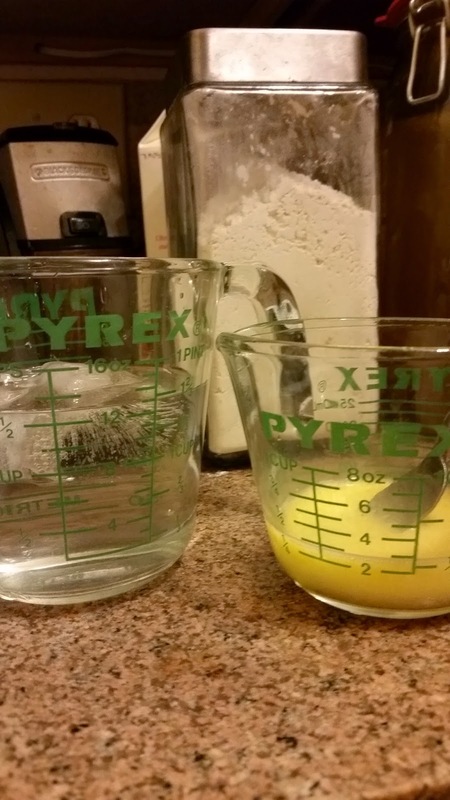 In a 1 or 2 cup measure, mix egg and vinegar with a fork. In another measuring cup or a glass, put some ice cubes in a cup of water and set aside to chill. 3. 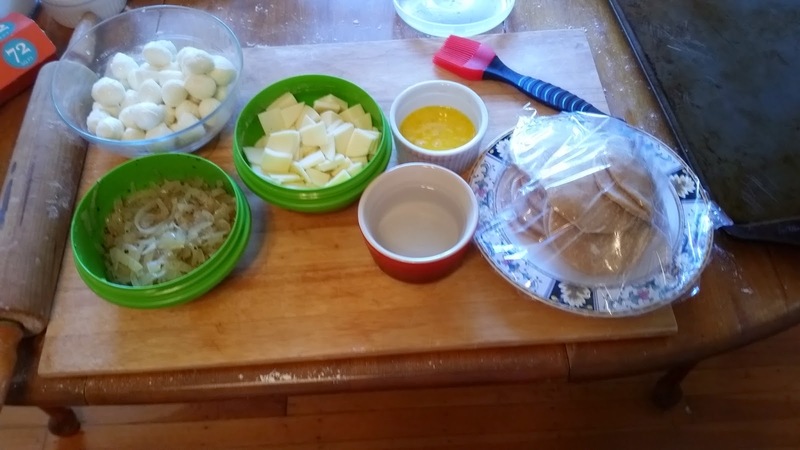 Remove the butter from the fridge just before cutting it up into little pieces (three to four cuts lengthwise and eight to ten cuts crosswise is good). 4. Add the butter to the bowl of flour. Follow the directions below for your method, blending until it looks like the picture by number 5. 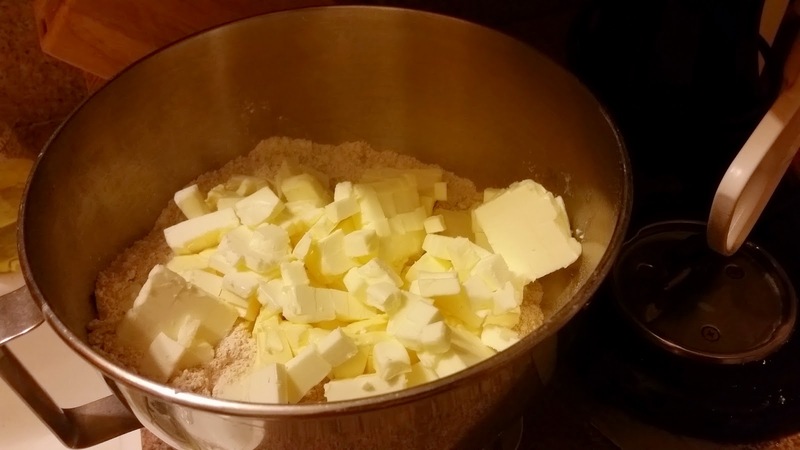 For hand mixing: cut butter into flour with a pastry cutter or a couple of knives. You can help it along with your fingers, but pop it back in the fridge for a couple of minutes when you're done if you do that. 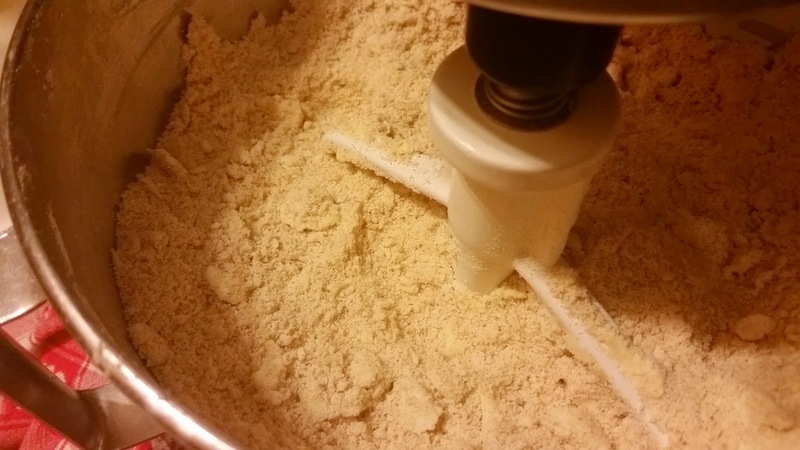 For the food processor: use the pulse button to blend the butter into the flour. For the stand mixer: cover the mixer with a clean dish towel as above to keep the flour from getting all over your kitchen. Turn the mixer on the lowest setting. Take away the towel after about 30 seconds. 5. When the butter is blended in, it will look like this. 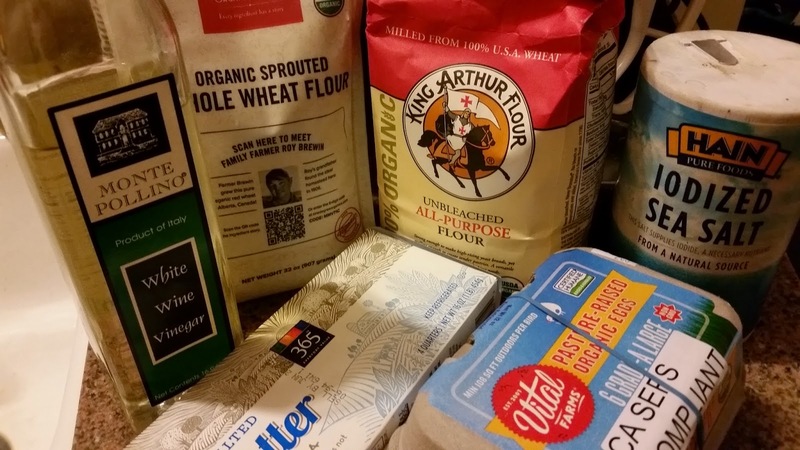 The color of the flour will have changed a little, and most of it will look like damp sand. Small pieces of butter that are still visible are good - they'll make the pastry nice and flaky. 6. 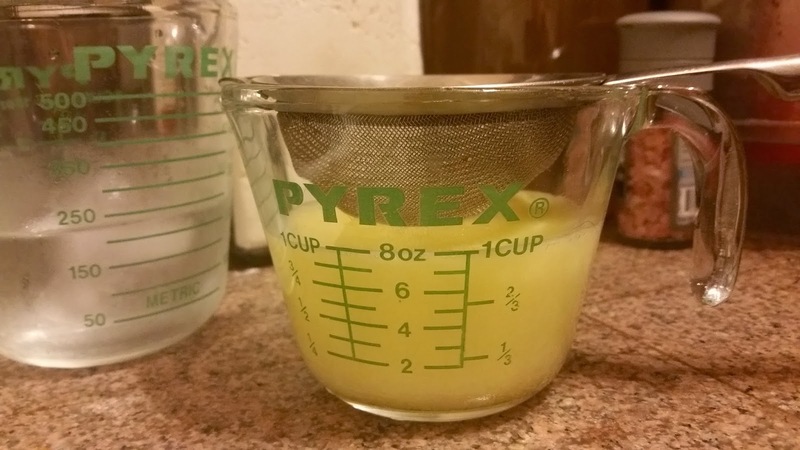 Add enough of the ice water to the egg and vinegar mixture to make one cup total of liquid. I use a strainer to keep the ice cubes out because if I don't, I usually end up dumping in too much water. If you have a steadier hand than I, you don't need it. 7. Add the liquids to the flour mixture. 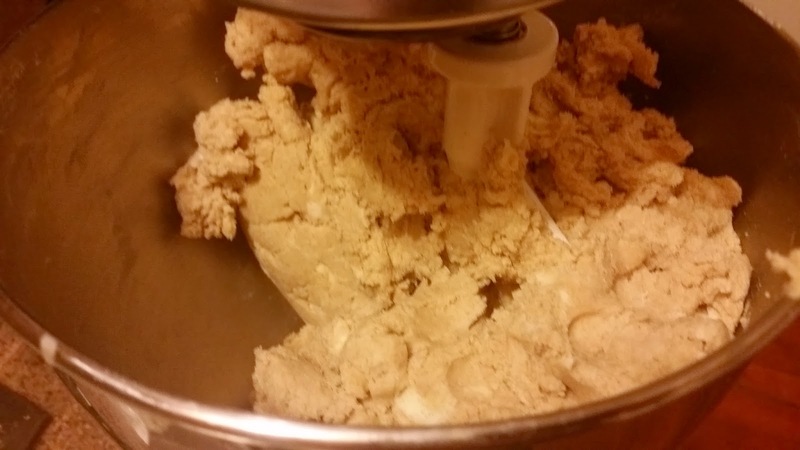 Mix -just- until the dough comes together like so. If you see some small butter spots in the dough, that's good. stand mixer: cover with towel again for first few seconds, mix on lowest setting. This took just under a minute. 8. Lay out a large piece of parchment or waxed paper. 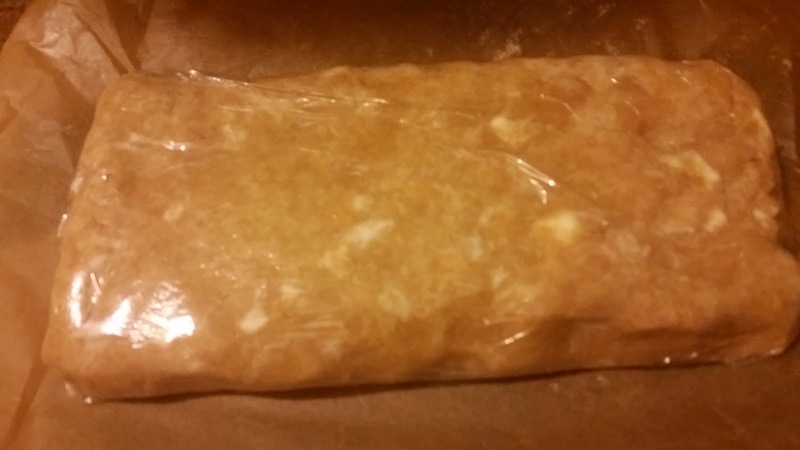 Pat the dough out into a large rectangle, approx. 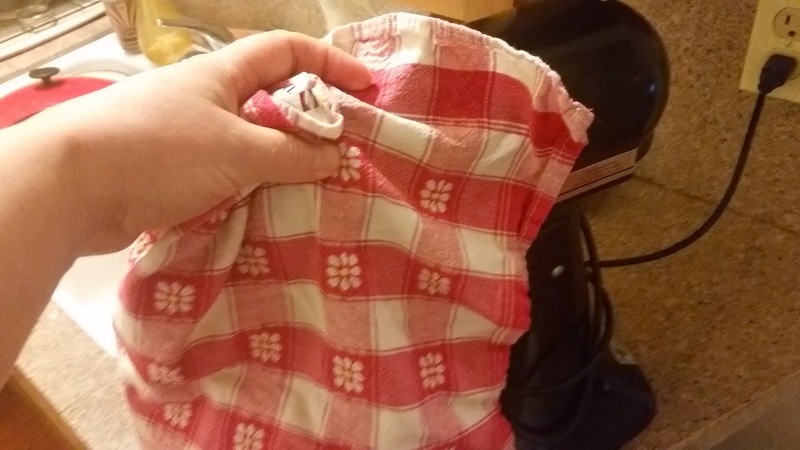 9" x 15" but I've never measured mine. Pushing up from underneath with the paper, fold each of the long ends of the dough over the middle and press down gently. Now the dough has to rest in the fridge for 30 minutes (or overnight if you want to roll it out the next day). 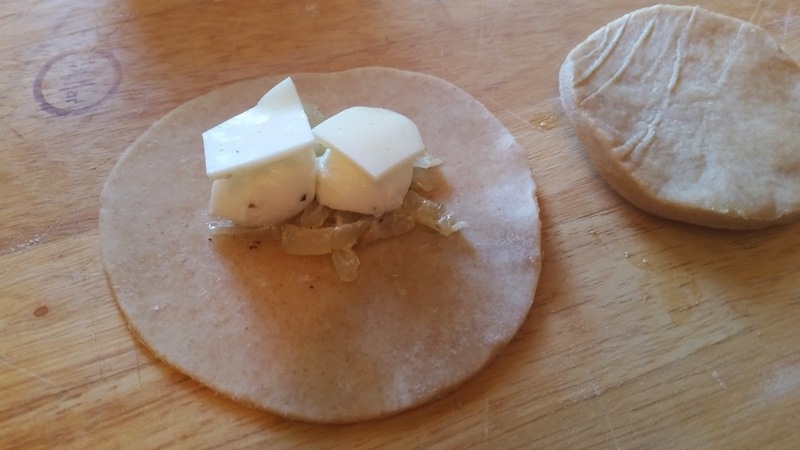 Wrap the dough in plastic wrap, or if you're morally opposed to plastic wrap (I'm getting there), wrap it tightly with the paper and cover with recyclable aluminum foil or a slightly damp dish towel to keep it from drying out. Take a third of the dough out of the fridge. Put the rest back in the fridge to stay cool. Put flour on a large cutting board or clean piece of counter space liberally. Put down dough and flour that, too. Start rolling by pushing the rolling pin down into the middle of the dough - this will help it roll out more evenly. 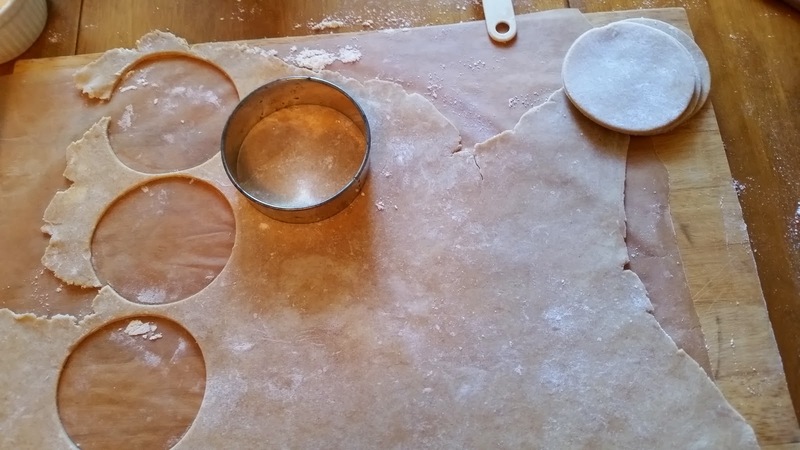 Roll to about 1/8" thick, then cut circles with a biscuit cutter, cookie cutter or anything straight sided. This cutter is about 4 inches round. Don't fret too much if not every piece is exactly the same. You'll roll each circle once more quickly before filling. Repeat the process with each third of the dough, refrigerating the cut circles in between. Set up the cooled filling(s), a sheet pan, a ramekin of water and a ramekin with one beaten egg to brush the tops with. Give each circle one more quick roll to thin it out and make it more pliable, then put filling in the center. Dip a finger in the water and wet the outer edge of one half the circle to help it stick together. 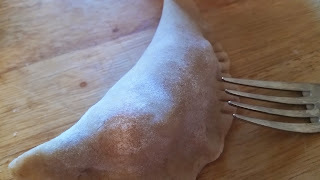 Fold the pastry over and press it together with your fingers. Then press it again with the tines of a fork. 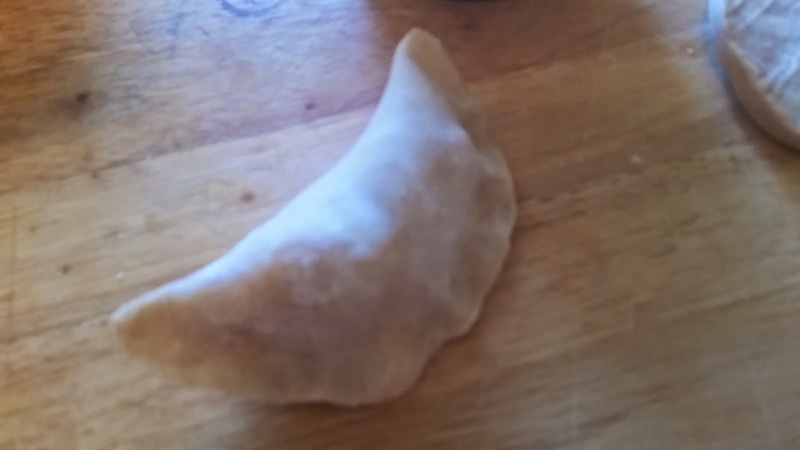 This is the simplest way to seal the empanada, but if you make more than one kind of filling you'll have to learn more seals so you can tell which is which, as below! Brush the egg over the tops of the empanadas to help them brown. Bake at 400 degrees for 20 to 25 minutes. Remove from the pans after a minute and let cool on cooling racks. And there you have it!